How can you make the right decisions if everything you’ve been told is a lie? With absent parents and broken friends, twenty-one year old Ben is making choices, which are ruining his life. In jail, again, he and his cellmate, Jake, take a hostage in a futile gesture against a system they can’t control. This powerful, beautifully written novel gives a vivid and realistic picture of those we send to prison. Who would you rely on if you were locked up? Do we ask the most from the ones who have the least? Life is never easy when you are a boy inside. 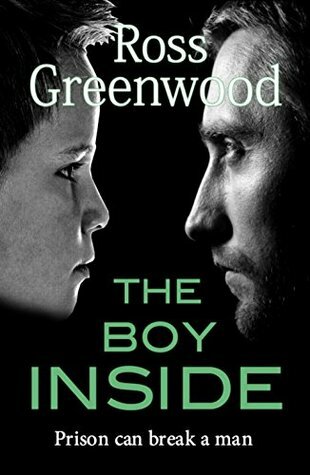 The Boy Inside is a truly harrowing drama with laugh-out-loud moments. It will appeal to fans of authors like Adam Croft, D.S. Butler and Casey Kelleher. It is loosely connected to Ross Greenwood’s debut thriller, Lazy Blood which is also available now. I was gutted that I couldn’t make the blog tour for this book as I was bowled over with Ross Greenwood’s debut novel Lazy Blood but already having heavy comments this was my first free date. Well wow this book was worth the wait. Ross Greenwood has taken me into a new world and I am just in awe of it all. As I followed the life of Ben I didn’t know if I feared for him the most when he was on the streets or locked up because trouble seemed to ride on his shoulder no matter where he was. I am sold on Ross Greenwood’s straight talking and brutal writing with out the flowering to make it easier to read. A shocking and graphic account of so many young men being born on the wrong side of town, with the wrong parents and bad company to hang out with. It is almost a passage of right, like following on a family tradition instead of being in a long line of Doctors though, these lads are harden criminals. This is the template of young men in many cites and towns. I couldn’t help but like Ben who was always determined to get out of this life one day but there was such easy money to be made too. The money that makes a difference when education and Ben had not travelled the same path and qualifications on the street were who you knew, who had your back and the best price for drugs. Prison was just something to be expected like one day getting married, and come it did for Ben and Jake his best friend, who was more of a bad luck charm an asset. The scenes in the prisons were to put it bluntly horrific and I am sure that my heart must have kept up beat for beat with Ben. There was one sure thing. In prison you can’t run, there is no escape and it is one place where the law seemed not to quite have the same meaning. This is the second book in a series of three novels but each can be read independently, though I am enjoying picking out the odd character from book one too. Loving these. There is something very refreshing about the writing and for what seem more like life journeys than stories. Just loving them! I was born in 1973 in Peterborough and lived there until I was 20, attending The King’s School in the city. I then began a rather nomadic existence, living and working all over the country and various parts of the world. I found myself returning to Peterborough many times over the years, usually when things had gone wrong. It was on one of these occasions that I met my partner about 100 metres from my back door whilst walking a dog. Two children swiftly followed. I’m still a little stunned by the pace of it now. This book was started a long time ago but parenthood and then four years as a prison officer got in the way. Ironically it was the four a.m. feed which gave me the opportunity to finish the book as unable to get back to sleep I completed it in the early morning hours. I hope you enjoy reading Lazy Blood.